Red and Yellow African Mask, "Safety and Security"
Carved by hand, this authentic African mask revels in bright, bold colors. An adinkra symbol on the forehead conveys conventional wisdom; this one is named Fihankra, from the Ashanti word for "house or compound" and is a symbol of security and safety. Godfred France designs and crafts the mask by hand. I have it displayed in a discreet corner of my main room and it has a commanding presence. Not too big, not small at all. Just right. 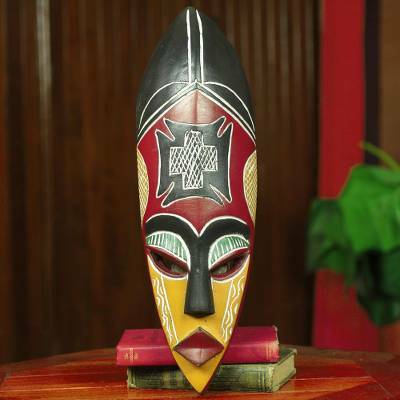 "I've received so many ahhhs for this lovely piece"
"Red and Yellow African Mask, 'Safety and Security'"
Colors do seem a bit dull when compared to the pictures of the item. I feel honored to hang this in my home. Thank you for the beautiful craftsmanship.